Recommended for Oily Skin. A lightweight, oil-free lotion for daily moisture protection to actively combat surface dehydration. This sheer, easy-to-apply formula contains Silk Amino Acids and a unique combination of plant extracts to help smooth and improve the skin's texture. Natural botanical astringents of Lemon, Watercress, Burdock and Ivy help to refine the skin while soothing extracts of Lavender, Mallow and Cucumber provide deep hydration. Contains no artificial fragrance or color. Have used this for years and love! Light feel , not greasy, and good for all skin types. This is the moisturizer I've used for the last 9 years, I've only switched from using it a few times and that was a big mistake. It's so light weight and has worked for me no matter the climate or how harsh the water is, I served in the navy on a ship where the water is especially harsh and during our six month deployments my skin was still glowing, but I was also using the whole dermalogica line like the cleanser, toner and prep scrub. I'm never switching again!!! I have used this product for 3 years and I am very happy with it. Dermalogica: As a 70-year old, and a user of all products Dermalogica for a good, long time, I can say the products have exactly what your skin needs, not too much, but definitely enough to bring out the best in one's features. It's light, non-perfumed, helps makeup go on easier, or use without. It's sufficient to sustain your beautiful smile! 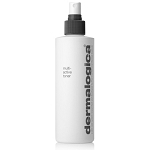 I have been using this product and many others of Dermalogica for more than 10 years. I would recommend the Dermalogica products to all those who want a moist complexion. I just started using Active Moist and so sorry I hadn't used it before. Even though my skin is dry, it feels so soft now that I use it. This is my main moisturizer. At nighttime I do add the hydrating booster just too extra hydration during the night and I must say this moisturizer has worked miracles since I have been using it!!! !